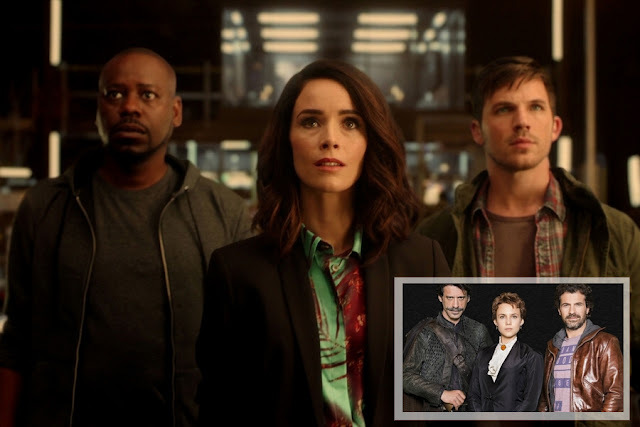 Home / featured / ministerio del tiempo / ministry of time / NBC / NBC 2015-16 season / Spanish TV / time ministry / Timeless / Are ‘Timeless’ and Spanish show ‘El Ministerio del Tiempo’ really the same show? Some of you may have heard about the new time-travelling show Timeless, AKA the latest network sci-fi that will probably get cancelled too soon [or too late, depending on how you choose to look at it]. The show follows the adventures of an unlikely trio who travel back in time to prevent the baddies from changing history. 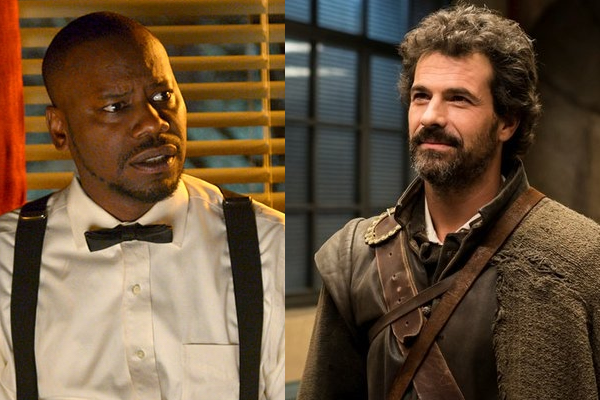 As it turns out, for the past two years there has been a Spanish TV series, “The Time Ministry” (El Ministerio del Tiempo) that follows the adventures of an unlikely trio who travel back in time to prevent the baddies from changing history. And yes… you guessed it, there is a law-suit out there. I’ve seen several Spanish articles comparing both shows, but I doubt anyone State side actually watched The Time Ministry. But I did! As we have established, the basic premise for both shows is virtually identical. However if you go in a littler deeper, there are a few differences. For instance, Timeless uses an egg shaped time-traveling machine, while The Time Ministry uses “time doors” with the help of a decoder notebook [although there is also a mobile app]. There are several other details that differ from one show to the other and the “time-trips” have had nothing in common so far, but the basic concept is the same. The Americans have so far traveled back to the Alamo, met Kennedy’s mistress and watched Abraham Lincoln die. In turn, the Spanish had trips where they met classic figures of their history like Lope de Vega and Cervantes; plus Diego Velazquez [who you might know because he painted this] is a recurring character. On both versions the female character is the smartest and most knowledgeable of the bunch [yay girl-power, I suppose]. Lucy is a college history professor. Amelia is a student with genius level intellect. This is particularly impressive since Amelia comes from the 19th century. That’s something that The Time Ministry did differently [and cleverly]. The main characters come from different time periods. On Timeless they are all from our time. True to the tropes of the genre, both shows have a character that fulfills the purpose of being “the muscle” of the crew. On Timeless he is a former [very good-looking] soldier, who lost his wife. The Time Ministry has a colorful character - Alonso de Entrerrios - a soldier from the 16th century who has a hard time adjusting to the modern times. Timeless cast Matt Latner on this role, so I’m assuming he will also be the romantic lead at some point. [He’s way too pretty to not get some at some point]. Timeless has Rufus Carlin, the scientist of the group who worked on developing the original time-machine. There isn’t a direct equivalent on The Time Ministry. The third character on the Spanish show is Julian - a former paramedic who… coincidentally lost his wife in an accident a few years ago… just like the Matt Latner character. The characters fit popular archetypes often used in genre fiction, but I have to admit, they are very similar [at least on the surface]. And this is where the shows are wildly different. Judging by tone alone, these shows have barely anything in common. The Time Ministry is a fun show that uses satire quite effectively. Don’t get me wrong, all the character development and intricate plot are there, but they keep things light and fun for the most part. Think about Doctor Who rather than Continuum. 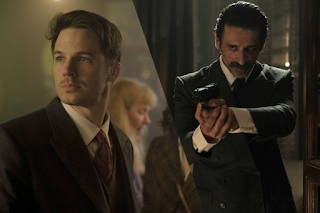 Timeless, on the other hand, takes itself seriously and relies on the action/adventure element to hold the show. Expect gunfights, people chasing each other and things exploding. 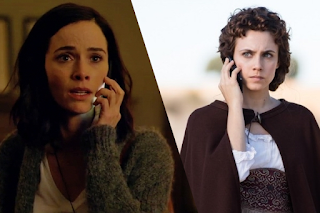 However [and this is my main complaint about Timeless] there aren’t a lot of scenes dedicated to characters and the relationships between them. But we are only a few episodes in. Are they really the same show? From a legal standpoint, no clue, I won’t even attempt to make a comment. If I learned something on my media law class, it was that this copyright suits are extremely complex. So I will leave that to the lawyers. As a viewer, I’d say they are very similar on the surface, but not really the same show once you start watching. In other words, they are different enough that you can watch both without getting bored [and that’s what I intend to do]. I’m only sad because I REALLY wanted a proper adaptation of The Time Ministry and that’s probably not going to happen now. If you are a lover of sci-fi [and you speak Spanish], I would absolutely encourage you to watch The Time Ministry. It is an absolute treat! I think there are subtitles in English for The Ministry of Time / The Time Ministry, so you don't need to speak Spanish to actually see it, but maybe you will lost some of the memorable jokes. This is inevitable, because many are rooted in Spanish culture. For example in the first episode the paramedic uses a fictional name (Curro Jiménez) as cover. As in Timeless using Denzel Washington or, let's say Clint Eastwood in Back to the Future 3. The difference is an added layer, as the fictional character of Curro Jiménez was played on Spanish TV by the father of the actor that plays the paramedic. Nearly impossible for a foreigner to get the joke at first. But, on the other side there are tons of jokes on Terminator or Groundhog Day, etc. Are there? (subtitles I mean) on the RTVE player? if so please let me know so I tweet out the link. I am not Spanish and I am sure I missed out a LOT of the jokes, yet still, the show (Ministerio del tiempo) was immensely enjoyable, funny and clever. I would enjoy if some company buy the rights and do a spin off or a type of plot connections with other countries with historical references, with France, UK, USA... and then make a collaboration between Spain plot writers and those of their own country. We would have a mega serie with a lot of potential. I would have loved that as well. As a Ministerio del Tiempo fan, the main problem with Timeless is that it is boring. No character development, no humour, simple Action. By-the-manual plot. Agreed!! I’m now watching season 3 of of El Ministerio del Tiempo and I love it, but I only ever managed a couple episodes of Timeless because I found it boring. Of course I spend a lot of time pausing and Googling because I don’t know much about Spanish history, but I love the show nonetheless! Just a little tip: Amelia Folch (Spanish version) is based on any of the first three women that had access to university in Spain's history (1882). That would explain that intellect. Hmmm. Obviously never watched the Spanish version, but I am finally starting care about the Timeless characters in the last couple of eps. If we want to suggest someone stealing ideas from someone else, let's look at Minstry of Time. It rips off Harry Potter a lot (Ministry of Magic, the use of doors as portals, the castle look (in one episode the walls of the Ministry are even covered with portraits), the composition of the group (Hermione - the smart one is the female student/Harry/Ron). They also have characters admit that the storylines are the same as The Terminator and Groundhog Day and Back to the Future. There have been many stories about doors that lead into the past, including Stephen King's 11/22/63 which came out a couple of years ago and featured a door where every time you went through it you went back to the very same day (like the Torquemada episode). THESE AREN'T ORIGINAL IDEAS. Timeless is a story about a man seeking vengeance and justice and to set right what once went wrong (Quantum Leap?) He steals a time machine and a pilot for it and sets out to change time. The government steps in and puts together a team to stop him. Everyone is from the present day. Only 3 people each can travel in time in each of 2 time machines. There are no specific locations required for time travel. No one else can time travel. El Ministerio del Tiempo is about a government agency whose directive is to monitor time to fix changes and the many teams they have that do it on a regular day-to-day basis. The show focuses on one team and their superiors. Most of the characters are from various points in time (and some are famous historical figures). Time travel is done by doors which are mostly in a subterranean facility, but there are other doors that are not under the Ministry's control and just about anyone can wander in and out of time doors. Another organization has time travel technology that doesn't center on doors. These shows are very different and you have to refer to specific things about them in very vague terms for them to seem the same. I watch both, love both, but the Spanish one is better. And I don't speak Spanish.